Hypoplastic left heart syndrome (HLHS) is a congenital heart defect, where the left side of the heart does not develop correctly. There is no known prevention for HLHS and without surgery; the heart defect is fatal, usually in a baby’s first few weeks of life1. Investigators of a Phase 1 study by the Mayo Clinic in the US believe that if they can make the right ventricle of the heart strong enough it can help in delaying and preventing the need for a heart transplant for a significant number of children with HLHS4. The study seeks to determine whether the right side of the heart’s muscle can be strengthened using a baby’s own (autologous) umbilical cord blood (UCB) stem cells2. The hope for the use of autologous cord blood, according to Study Director, Dr. Tim Nelson, is that it “causes a fertilizer type of an effect where these cells are able to fertilize the right ventricle muscle and allow it to grow bigger and stronger because it's received this cell-based therapy4." In a healthy heart, the right side pumps oxygen-poor blood to the lungs, and the left side pumps oxygen-rich blood throughout the rest of the body. However, in babies with HLHS, the right side of the heart must also perform the duty of the left side3. There are two small openings between the left and right side of a baby’s heart which close in the first few days after birth. For a baby with HLHS, prior to this closure, the oxygen-rich blood will bypass the left side of the heart, allowing the right side to pump this blood throughout the body. When these openings are closed, it is difficult for the oxygen-rich blood to get to the rest of the body which is why medication to prevent the closure, followed by a heart transplant or surgery, is required to treat the defect1,3. A series of three surgeries which serve to essentially “rework the plumbing of the heart” are used to treat HLHS 4. While these surgeries do help to restore heart function, they are not a cure for HLHS. Children who have had the surgeries may still have lifelong complications3. This collaborative cord blood stem cell research will assist the determination of the safety and feasibility of injections of autologous UCB cells into the right ventricle of HLHS children who are undergoing a scheduled Glenn surgical procedure2. The Glenn surgical procedure is the second of the three surgeries, which is conducted at between three to six months after birth4. Alabama boy, Ryals, a participant in the trial, is amongst the first to receive his own umbilical cord blood stem cells, injected into his heart while having his Glenn surgical procedure. The HLHS team at the Mayo Clinic has begun creating a HLHS research consortium to expand the research and help more families. In addition to the Mayo Clinic, the consortium consists of Children's Hospital of Philadelphia, Children's Hospital of Los Angeles and Children's Minnesota4. This Phase 1 study of Autologous UCB cells for treatment of HLHS will help identify the safety and feasibility of cell-based regenerative therapy being utilised as an additional treatment for the management of HLHS2. More broadly, regenerative therapies using cord blood are being evaluated through ongoing research for the capacity of these powerful stem cells to aid in the treatment of a number of conditions. It is the anti-inflammatory, immunoregulatory, and proliferative properties of cord blood stem cells which underpin their diverse functional therapeutic potential. The increasing number of cord blood units being released for regenerative medicine applications aids the exploration of this potential. 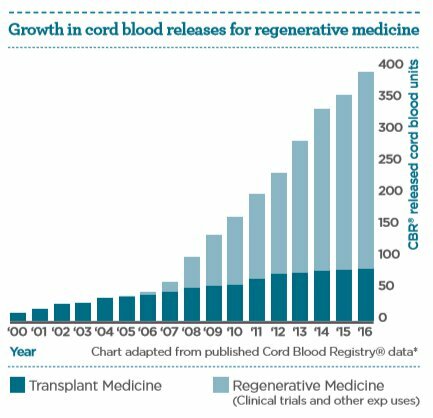 Today, more than 40,000 cord blood transplantations5 have been performed worldwide in the treatment of over 80 conditions6. Research continues to evaluate how cord blood cells may provide new therapies for a broad number of diseases for which there is no effective treatment today.